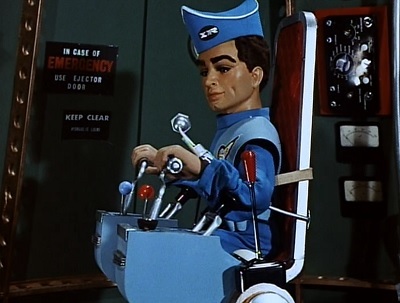 It’s safe to say that Thunderbirds is Daniel’s runaway favorite among these three shows, although it was really funny tonight, since the other shows are causing mild frights, seeing him demand to have something to send him behind the sofa. Three-quarters into the episode, which has had a fiery pit present in the narrative since about the six-minute mark, he shouted “I’m afraid of the fire!” and he hid behind the sofa for about seven seconds. Then he realized he’d be missing something exciting and popped his head up again. Several Thunderbirds episodes were in the can, filmed as half-hour shows, before ITC’s director, Lew Grade, sat down to watch a couple and decided that he could sell it to an American network if it was a one-hour show. So some of the early episodes went back to be retooled and new footage shot to pad them out. “Pit of Peril” really feels like it must be one of these. About half of the episode deals with the nine soldiers in the African jungle, three of their number in a “Sidewinder” walking vehicle that’s fallen three hundred feet down an old mine pit where a fire has been burning for eighty years. Kind of like Centralia,_Pennsylvania. There’s also quite a lot of stock footage of wild animals. Anyway, International Rescue only hovers on the fringes of the story for its first half, and then there’s the repetition, as we’ll see constantly, of the overly-complicated – but completely glorious and awesomely cool – Thunderbird 2 launch sequence. Nobody minds watching this footage again and again. It may be padding, but it’s the coolest padding ever filmed. But whether “Pit of Peril” went back to the studio for additional filming or not, the script by Alan Fennell, who would write almost all of the Thunderbirds comic in TV Century 21 never feels bloated even though Scott, Virgil, and Brains have just about fifteen minutes of action in the story. Daniel was at the edge of his seat as every rescue attempt was tried, and he was jumping up and down during the physics-defying climax, as two little tanks drag a 500-ton machine 300 feet up the side of the mine inside three minutes. This is the first episode to feature the drilling machine “The Mole.” If International Rescue would let me borrow that thing for an afternoon, I would love to do something about suburban Atlanta’s traffic problem. I daydream about it from time to time when I am not moving. I don’t agree with anybody who disliked that Jonathan Frakes Thunderbirds film from a few years ago, because firstly it was perfectly acceptable kids’ entertainment for the Spy Kids generation, and secondly because holy anna, that launch sequence, in that high quality, on a big screen, was the greatest thing ever.